Based on John Steinbeck's novel and directed by Elia Kazan, East of Eden is the first of three major films that make up James Dean's movie legacy. The 24-year-old idol-to-be plays Cal, a wayward Salinas Valley youth who vies for the affection of his hardened father (Raymond Massey) with his favored brother Aron (Richard Davalos). Playing off the haunting sensitivity of Julie Harris, Dean's performance earned one of the film's four Academy Award nominations. * Among the movie's stellar performances, Jo Van Fleet won the Oscar as Best Supporting Actress. 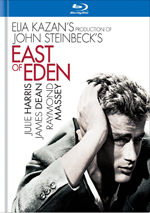 The first of James Dean’s three films, 1955’s East of Eden adapts the John Steinbeck novel. It starts with some geographical information as it informs us that “in northern California, the Santa Lucia Mountains, dark and brooding, stand like a wall between the peaceful agricultural town of Salinas and the rough and tumble fishing port of Monterey 15 miles away.” Set in 1917, the film uses those locations to introduce us oddball Salinas teen Cal Trask (Dean) as he stalks Monterey brothel owner Kate (Jo Van Fleet). He declares his hatred for Kate and then flees on a train back to Salinas. Soon we meet Cal’s brother Aron (Richard Davalos), his girlfriend Abra (Julie Harris) and their stern father Adam (Raymond Massey). We quickly figure out that Aron’s the good son while Cal’s a distant loner whose father disapproves of him and his odd behavior. Aron feels amused by Cal’s weird antics, but the kid creeps out Abra. Soon we get a hint at the cause of Cal’s current misbehavior. Adam always told the kids that their mother died, but Cal finds reason to believe differently and he grills his dad about this. Adam admits that he lied but denies any knowledge of the mother’s whereabouts as he talks about how she’s full of “hate”. With that Cal runs back to Kate’s brothel. He slips in and meets barmaid Anne (Lois Smith) who he asks about Kate. Reluctantly she helps him get into Kate’s office where he goes to confirm his belief that she’s his mother. She reacts negatively and gets the kid bounced immediately. Sam the local sheriff (Burl Ives) brings in Cal and also lets him know a little about his mother. Cal suspects Adam did something to hurt her and drive her away, but Sam denies this and believes Cal’s dad is too good a man to have done anything like that. This seems to inspire Cal to change his ways, as he starts to work harder to please his dad and not act like such a weirdo. This bonding makes a big difference to Cal, and when Adam’s food refrigeration experiment fails, the boy tries to do what he can to earn back the money his dad lost. This means he requires $5000 to invest, he tries to strike up a relationship with Kate. She now knows his identity, and she reluctantly agrees to loan him the money. Soon the US enters World War I, an event that should bring a monetary bonanza to Cal through his investment in beans. That makes Cal happy to see war, but Aron doesn’t believe in America’s involvement and views the conflict negatively. Because of that, he seems to slip away from Abra, who worries that she’ll lose him. Clearly Cal longs to be with Abra and she reciprocates to a degree, a factor that complicates matters. Things get worse when Aron becomes jealous and fights with Cal. The rest of the film follows that storyline as well as the ways the boys compete for their father’s approval. Nearly 60 years after his death, James Dean remains a pop culture icon, and East of Eden reminds us why. During his brief time in movies, he perfectly captured a sense of awkward cool. Actually, in many ways, Dean made for an unlikely teen idol sort simply because he displayed such a flawed personality. He wasn’t suave or sophisticated. Not only did his rough edges show, but he accentuated them and made the flaws a prominent part of his characters. As Cal, Dean presents a mumbly, stammering, navel-gazing style. He borders on becoming too mannered and self-conscious but manages to stay honest instead. Cal may not be quite as iconic as Dean’s portrayal of Jim Stark in Rebel Without a Cause, but he’s an effective and compelling presence here. Eden creates a mostly intriguing character drama, but not one without its flaws. Happily, it doesn’t play up the mystery of Kate’s identity for too long. It touches on this area just enough to lure us in but then it drops the boom and focuses on the various dynamics and relationships to keep our interest. This is a good approach since it’s obvious pretty quickly that Kate is Cal’s mom. Attempts to prolong the suspense would feel contrived and tedious. Most of Eden unravels slowly; it doesn’t tip its hand too quickly but also doesn’t keep us annoyingly in the dark. One weakness comes from the various character arcs. The personalities seen in the first act differ greatly by the movie’s conclusion, and it doesn’t handle those transitions terribly well. Cal changes his sullen ways awfully quickly, and that turn prompts former golden boy Aron to become morose and vengeful. I accept these alterations to a degree, though I’m not sure I believe that decades of behavior would change quite so abruptly. The problem is the rapidity with which this occurs; the two boys flop personalities without much time involved. Actually, the main supporting characters change radically as well. Though Cal initially gives her the creeps, Abra warms up to him in the blink of an eye, and Adam also goes from stern to jolly without much prompting. Again, I can accept character growth, but the rapidity with which this occurs in the movie seems tough to believe. I guess that’s what comes with the territory when you adapt a 600-page book. You lose the ability to develop smooth characterizations. Actually, although I never read Eden, I found that the movie dropped a lot more than that. Apparently the book initially focuses on the story of Adam as a young man, whereas the movie totally skips all of that. I won’t criticize the flick for that, as it’d have to run four hours to cover all that material - and it’d still probably seem too rushed. As Eden starts to concentrate more on the Cal/Aron/Abra love triangle, it loses track of the others too much. Adam and Kate turn into little more than plot devices, and the story occasionally loses focus. Some of this relates to the issues with the characters and their changes, as the variations make it tougher to keep things on track. Though all of these comments make it sound like I didn’t care for East of Eden, that’s not the case. The movie remains consistently entertaining, and the strong performances - especially from Dean - help make it a good piece of work. I find some fault with its storytelling and characterizations, but overall, the film comes across as involving and compelling. East of Eden appears in an aspect ratio of approximately 2.55:1 on this Blu-ray Disc. Overall, I felt pleased with the presentation. Sharpness usually looked solid, as the flick usually presented a nicely distinctive and detailed picture. Some of the photographic techniques occasionally resulted in soft shots, but those remained in the minority; most of the movie seemed accurate and well-defined. No issues with jagged edges or shimmering occurred, and I saw no edge haloes. Digital noise reduction didn’t appear to mar the transfer, and the flick came with virtually no print flaws. Eden came with a slightly yellowed palette. I wasn’t sure how much of this resulted from production design and how much came from the film stock, though I got the feeling both factors contributed. This tone fit the California setting and didn’t restrict the colors heavily. When necessary, the hues were rich and bright. Blacks came across as nicely deep and rich, while low-light shots demonstrated good clarity and definition. Across the board, the movie looked pretty nice. The DTS-HD MA 5.1 soundtrack of East of Eden provided highs and lows. The soundfield fell into the “highs” category as it offered a surprisingly broad experience. A great deal of localized speech occurred, and the score presented nice stereo delineation. Effects weren’t a major factor in the proceedings, but they also popped up in the appropriate spots. The whole thing could be somewhat “speaker specific” at times, but given the fact that the vast majority of movies from the era only featured monaural audio, I didn’t take this as a negative. Surround usage remained minor. Music demonstrated some light reinforcement, and occasional effects material popped up as well. Nothing too exciting occurred, but the rears fleshed out things decently. Again, the track was definitely stronger than usual for a flick from 1954. With all those positives, why did Eden end up with a “B” for sound? Because the quality wasn’t up to snuff. Actually, some parts of it were pretty good. The score often sounded moderately robust, though highs turned a little rough at times. Speech was decent. Some weak dubbing made lines a bit flat and dull at times – and lip-synch could suffer – but the dialogue usually sounded fine. Effects demonstrated fair reproduction given their age; they didn’t boast great clarity, but they came with reasonable accuracy and heft. Nothing here dazzled, but the audio remained more than adequate for its age. How did the Blu-ray compare to the original DVD from 2005? Audio sounded cleaner and clearer, while visuals were bolder and more concise. The Blu-ray gave us obvious improvements over its predecessor. 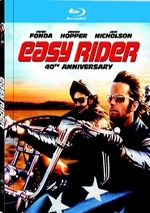 The Blu-ray replicates the DVD’s extras. In addition to the movie’s trailer, we find an audio commentary with film critic Richard Schickel. Because of his track record, I greet Schickel commentaries with trepidation; he’s created an awful lot of mediocre chats. A sense of déjà vu greeted me as I listened to another Schickel discussion that only occasionally became involving. Schickel gets into notes about the cast and crew and their backgrounds, director Elia Kazan’s methods, James Dean’s acting style, using the Cinemascope frame, and his interpretation, analysis and criticism of the film. Those latter elements strongly dominated the piece. Schickel tossed out occasional notes about the production and its participants, but he usually stayed with his critique. As with Schickel’s prior commentaries, he occasionally provided insightful tidbits, but not with great frequency. Instead, Schickel often just mentioned obvious elements or narrated the movie. A few of his remarks were thought provoking, but not many of them. Quite a lot of dead air marred the discussion and it became pretty tedious. Honestly, Warner needs to lose Schickel’s phone number, as he rarely offers commentaries that are truly worth the effort. Next we move to a documentary called East of Eden: Art In Search of Life. This 19-minute and 31-second program combines the usual array of archival materials, movie clips, and interviews with Schickel, San Jose State University’s Center for Steinbeck Studies director Susan Schillinglaw, Steinbeck’s son Tom, director Elia Kazan, James Dean’s friend William Bast, and actors Julie Harris and Lonny Chapman. 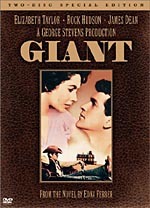 “Art” covers Steinbeck’s novel and its elements, the way Steinbeck put his personal life into his work, the characters, Kazan’s personal take on the material and the adaptation of the book, the relationship between Kazan and Steinbeck, casting, work and conflicts on the set, observations about James Dean, Kazan’s methods, and various legacies. Tight and informative, “Art” goes through the appropriate topics well. I like the progression from novel to film, and the program picks up on much of what we want to know. Some of this repeats from Schickel’s commentary, but most of it’s new to us. There’s a lot of insight and useful information in this crisp featurette. Referred to as a “vintage documentary”, Forever James Dean fills 59 minutes and 50 seconds. Created in 1988, it includes comments from Bast, Harris, boyhood friends Bob Roth, Rex Bright, and Bob Pulley, writer/producer Frank Worth, actors Jack Grinnage, Corey Allen, Frank Mazzola, and Beverly Long, former actress Steffi Sidney, automotive designer George Barris, teacher Adeline Nall, and artist Kenneth Kendall. The show looks at Dean’s death and the reactions it inspired before it goes back to the actor’s youth. We hear about the era in which Dean was born as we go through the important events of his childhood and general interests of that period. Then we see Dean’s move to Hollywood, his attempts to become an actor, and related events. We follow Dean’s failed attempts to land many jobs in LA before we watch him head to New York and try his luck there. This leads to his breakthrough role in Eden, its shoot, and Dean’s subsequent work in Rebel Without a Cause and Giant. We also learn of Dean’s romances and other personal concerns until we get to his death in 1955. Some aspects of “Forever” haven’t aged well over the last 25 years; for instance, the awful song “American Rebel” starts the show on a cheesy tone, and a montage in which it features midway works in a similarly poor way. Despite those, the whole product fares well, largely due to all the personal memories. It offers a good basic biography but only excels when we get into the details. Those make “Forever” insightful and introspective. The Deleted Scenes area lasts 19 minutes and 15 seconds. It presents a conversation between Cal and Aron about their father’s feelings and more of the birthday party for Adam. We get multiple takes of the various shots, so don’t expect a full slate of new material. Nothing revealing appears in the party scenes, but the chat between Cal and Aron works well. It fleshes out Cal’s character change and might have been a useful addition to the film. Next we get six minutes and 21 seconds of Screen Tests as well as 22 minutes and 29 seconds of Wardrobe Tests. In the former domain, we get screen tests between Dean and Davalos as they perform the discussion between Cal and Aron that we already saw as a deleted scene. It’s a decent tidbit, though it’s too bad we don’t see some of the other existing screen tests as well. All of the “Wardrobe” section presents silent footage as we watch Davalos, Dean, Harris, Lois Smith and Jo Van Fleet try out different looks. This also acts as a vaguely cool archival bit, though it doesn’t exactly make for scintillating viewing. The disc finishes with some 3/19/1955 New York Premiere Footage. This segment goes for 14 minutes and 42 seconds as it mostly focuses on the activities in front of the theater. Host Martin Block chats with the following notables as they enter: Margaret Truman, Milton Berle, John Steinbeck, Elia Kazan, Raymond Massey, Eva Marie Saint, Red Buttons, Jack Warner, Denise Darcell, Imogene Coca, Carol Channing, and Joel Grey. Of course, virtually nothing of substance occurs, but it’s a fun piece to watch. I particularly like Steinbeck’s very uncomfortable conversation; the author doesn’t look happy to be there. East of Eden would remain interesting simply for its historical value. Happily, despite some flaws, it offers a frequently compelling tale with a mix of positives highlighted by some strong performances. The Blu-ray delivers very good picture and audio along with a roster of supplements that works pretty well despite a lackluster audio commentary. I doubt Eden ever looked better than it does on this fine Blu-ray. Note that East of Eden can be found on its own or as part of a three-film “James Dean Ultimate Collector’s Edition”. 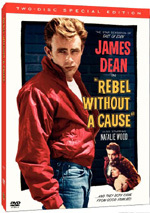 This also includes Rebel Without a Cause, Giant, three bonus discs and additional paper materials. The “UCE” retails for $99.98 which makes it a good deal for Dean fans who want to own all three movies.